Custom Nike Rivalry Warm Up Jacket is a top rated team warm up jacket for cheer, dance, and gymnastic teams that comes in Adult women and men sizes only. Can be customized with your logo and team member name to sparkle and shine! This team warm up jacket can be customized with bling rhinestones, sequins, or in glitter. Customized Jacket costs between $90-110 depending on the size and amount of customizing needed to front and back of jacket. It is an additional $50 for the matching pants with rhinestones. Email or call to start working on your order and custom price based on your required specs. Gear up with the lightweight, breathable Nike Team Rivalry Jacket. Lightweight knit warm-up and travel jacket designed for comfort. Custom Nike Overtime Warm Up Jacket is a top rated team warm up jacket for cheer, dance, and gymnastic teams that comes in Adult women and men sizes only. Can be customized with your logo and team member name to sparkle and shine! This team warm up jacket can be customized with bling rhinestones, sequins, or in glitter. Customized Jacket costs between $90-110 depending on the size and amount of customizing needed to front and back of jacket. It is an additional $50 for the matching pants with rhinestones. Email or call to start working on your order and custom price based on your required specs. 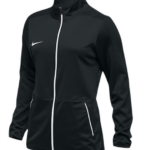 One of our top warmups for cheer and dance teams is Nike’s Women’s Team Overtime jacket with the matching pants. The jacket is 100% polyester and made with a women’s cut. 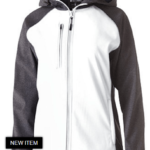 It does have the full front zip up and side pockets with flap closure. 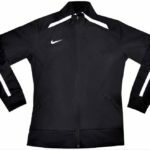 Custom Nike Running Warm Up Jacket is a top rated team warm up jacket for cheer, dance, and gymnastic teams that comes in Adult women and men sizes only. Can be customized with your logo and team member name to sparkle and shine! This team warm up jacket can be customized with bling rhinestones, sequins, or in glitter. Customized Jacket costs between $90-110 depending on the size and amount of customizing needed to front and back of jacket. It is an additional $50 for the matching pants with rhinestones. Email or call to start working on your order and custom price based on your required specs. Stay warm, loose, and fresh on those cooler race days. Side seam pockets. Elastic binding at cuff. Shaped hem with a cord lock and bungee for adjustability. Articulated sleeve with darts to enhance fit and movement. 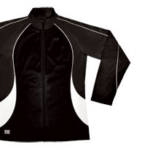 Custom Premier Augusta Warm Up Jacket comes in Adult ladies and men’s sizes. Can be customized with your logo in sparkle and shine! 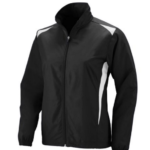 Custom Raider soft shell jacket comes in adult ladies and mens sizes. Can be customized with your logo in sparkle and shine! Soffe Breakthrough Jacket comes in Adult ladies and youth sizes. Can be customized with your logo! The Soffe® Breakthrough Jacket is another great option to customize for your cheer or dance team warmups with team colors and bling. These jackets are 100% polyester, tricot knit, and ladies cut. 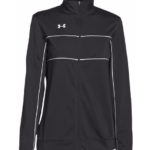 Custom Under Armor Rival Warm Up Jacket for your cheer, dance, or gymnastics team. The jacket comes in woman and men sizes only. Can be customized with your logo and team member name to sparkle and shine! This team warm up jacket can be customized with bling rhinestones, sequins, or in glitter. Customized Jacket costs between $90-110 depending on the size and amount of customizing needed to front and back of jacket. It is an additional $50 for the matching pants with rhinestones. Email or call to start working on your order and custom price based on your required specs. 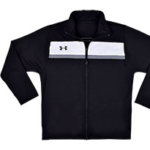 Custom Under Armour Technique Jacket is a top rated team warm up jacket for cheer, dance, and gymnastic teams that comes in Adult women and men sizes only. Can be customized with your logo and team member name to sparkle and shine! This team warm up jacket can be customized with bling rhinestones, sequins, or in glitter. Customized Jacket costs between $90-110 depending on the size and amount of customizing needed to front and back of jacket. It is an additional $50 for the matching pants with rhinestones. Email or call to start working on your order and custom price based on your required specs. The Edge jacket comes in adult ladies and youth sizes. Can be customized with your cheer or dance team logo and team member name! 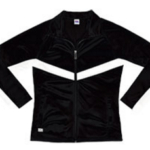 This warm up jacket can be customized with bling rhinestones, sequins, or in glitter. Customized Jacket costs between $55-75 depending on the size and amount of customizing needed to front and back of jacket. It is an additional $30 for the matching pants without rhinestones. Email or call to start working on your order and custom price based on your required specs. 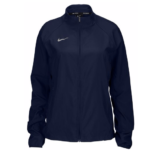 This warmup jacket is great for your team, parents and team volunteers. Keep this warmup jacket handy in the cooler months to make sure your girls always have spirit. 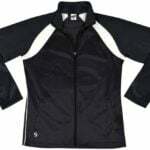 Zoe athletics wave jacket comes in adult ladies and youth sizes. Can be customized with your logo in sparkle and shine! Don’t let cold weather cool of the competition! Keep warm in this team jacket. 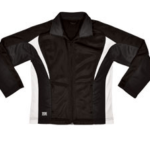 Zoe Boom Warm up jacket comes in adult ladies and youth sizes. Can be customized with your logo! Never shy away from spirit on a chilly night again in this warmup jacket. 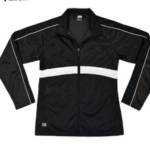 Pure warm up jacket comes in adult ladies and youth sizes. Can be customized with your logo! Can be customized with your logo and team member name to sparkle and shine! This team warm up jacket can be customized with bling rhinestones, sequins, or in vinyl. Customized Jacket costs between $65-80 depending on the size and amount of customizing needed to front and back of jacket. It is an additional $30 for the matching pants without rhinestones. Email or call to start working on your order and custom price based on your required specs. 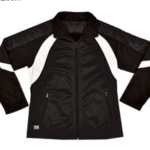 This warmup jacket is a great way to keep warm during outdoor events or on the way to practice.